PET is polyester, which has a chemical name of polyethylene terephthalate. PET is a plastic resin and the most commonly used plastic material. Thousands of consumer products, beverages and food items are delivered and packaged within this material. Manufacturers like it because it is strong, safe, transparent, and versatile. Customers like it because it’s safe, lightweight and 100% recyclable. The benefit of PET is that it doesn’t transfer any chemicals to the product it comes in contact with, so it’s an ideal solution for food products. IS THERE A DIFFERENCE BETWEEN PET, APET, OR PETG? There is no difference between PET and APET plastic. PET is polyester, which has a chemical name of polyethylene terephthalate. PET can be made with the polymers aligned in two primary ways; amorphous or crystalline. Virtually, all you come in contact with is amorphous with one major exception; microwave food trays which, if made from PET, are made from C-PET (crystallized PET). Essentially all clear PET including Mylar and water bottles are made from A-PET (amorphous PET) and in many cases, the “A” is simply left off. 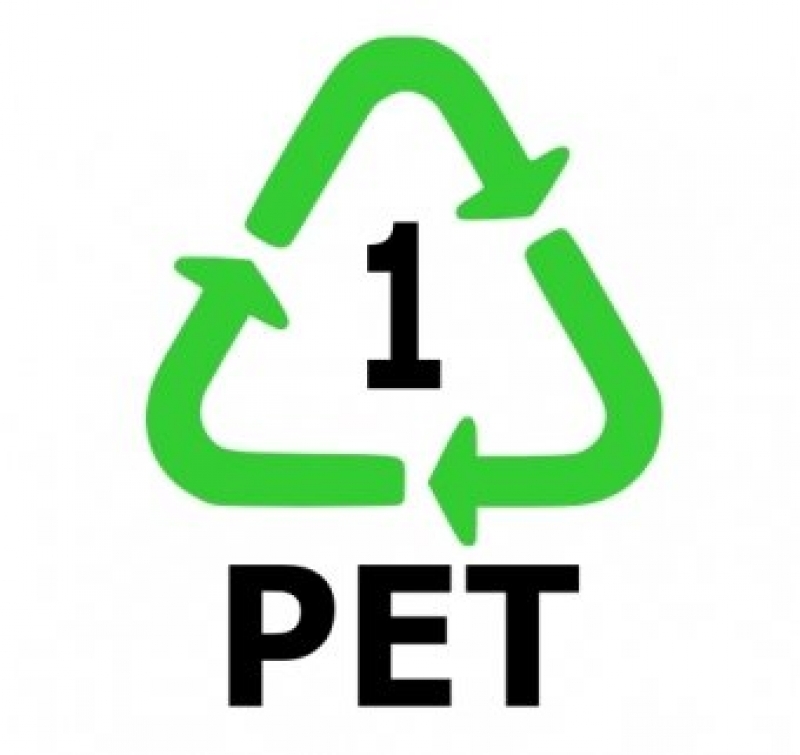 The Mobius loop recycling symbol for polyester is PET with the number 1, so a lot of people refer to polyester as PET. Others prefer to be more specific, by indicating whether the polyester is crystalline C-PET, amorphous APET, recycled RPET, or glycol modified PETG. These are small variations, intended to ease processing of polyester for the intended end product, whether by injection molding, blow molding, thermoforming, or extruding as well as finishing operations like die cutting. PETG comes with a much higher price point and is easier to die cut than APET using conventional die cutting equipment. At the same time, it is also softer and scratches much easier than APET. Converters who don’t have proper equipment to die cut APET often work with PETG because of the fact that PETG is softer and scratches easier, so it is usually poly masked (this is a thin “Saran wrap” type covering). This masking needs to be removed from one side during printing, but the masking is usually left on the other side during die cutting to prevent scratching. It is very time consuming and hence more expensive to remove the poly masking, especially if printing a lot of sheets. Many point of sale displays are made from PETG, since they are often heavy gauge and tough to die cut. Another reason is that the poly masking can be left on to protect the display during handling and shipping and then removed when the display is being set up. This is a main reason why many designers automatically specify PETG for point of sale displays without understanding whether APET or PETG is the most suitable material for the intended end use or the processing (printing, die cutting, gluing, etc.). APET is generally available up to 0.030″ thickness, whereas PETG usually starts at 0.020″. There are other subtle differences between PETG and APET, and if you’re not familiar with the benefits and draw backs of how PET is made, remembering the name becomes confusing, but it’s safe to say that all of the above refer to polyester and, from a recycling point of view, they are all treated the same.